A Master Plan for Rescue – A wonderful, beautiful book. I normally don’t read books set during WWII. I have a thing. An emotional thing about the WWII setting. There are so many, many terrible things that happened during this war. I just can’t read about it. Even fiction. Because I know that while the story I’m reading may be fiction, the facts of that time are not. It makes it difficult for me to read. So it’s pretty rare that I pick up a book set during WWII. A Master Plan for Rescue is one of those times. Typically, I don’t include the publisher’s summary on my review; I feel like you can click on the link I provide with the title and read it for yourself. But in this review, I think that an abbreviated version is fitting. For the summary is what really called me to read this book. 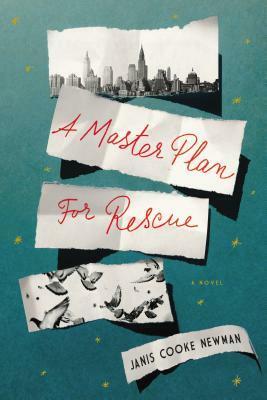 Set in 1942 New York and Berlin, A Master Plan for Rescue is an enchanting novel about the life-giving powers of storytelling, and the heroism that can be inspired by love. In essence, it is two love stories. It is the story of a child who worships his parents, then loses his father to an accident and his mother to her resulting grief. And it is the story of a young man who stumbles into the romance of his life, then watches her decline, forever changing the arc of his future. Each is propelled by the belief that if he acts heroically enough, it will restore some part of what — or whom — he has lost. Now I will say that after reading the book, I find the summary a bit misleading in that for the most part, this book is about (almost) twelve-year-old Jack. It’s told almost solely from Jack’s (now grown up and looking back) perspective, until about a third of the way through the novel when he meets Jakob. Jakob takes over for one (very long) chapter to tell his tale of being a Jew living in Berlin from the Olympic games in August 1936 to May 1939, when he was able to secure passage on the SS St. Louis. The book begins with a glimpse into Jack’s seemingly perfect life, eating a meal with his mother and father in the warmth of their Manhattan apartment. But this is the last moment like this for Jack, his world is about to change. At the same time that they hear an announcement on the radio that Pearl Harbor has been bombed, Jack’s eyes go terribly wrong and his world turns into a blur. I did not want to believe that something fundamental might have shifted. That for me, much like for the rest of the world, nothing would be the same. Jack gets glasses which correct his vision at about three feet away, any closer or further is out of focus. As he is struggling to find his place in this new (blurry) world, two things happen. The first is he finds himself lost in radio programs, listening and letting his imagination soar. The second is that he loses his father in a terrible accident that happens right in front of him. Thanks to the influence of his radio programs that he loves to listen to, Jack convinces himself that his father did not die, but instead he is out there, somewhere, helping the government round up Nazi spies. Jack is determined to help his father by finding a Nazi spy too. He is sure that once he does this, his father will come back home. I can only imagine that by then, the line between the real world and the the radio world had become as blurred as most things were to me. Jakob on the other hand, has a tale of great love and great loss. He must be in his early 30’s, yet the life he had already led makes him seem so much older. This book was beautifully written, and very moving. Jack possesses such a power of belief – and hope. Belief that his father is still alive, and that he can communicate with him through a special toy decoder. Belief that if he just helps his father round up one Nazi spy he can see him again. Hanging on to this hope pushes Jack to take action with results that he never would have dreamed. I love the way Ms. Newman weaves historical events into her story. From the brief mention of a Nazi submarine entering New York waters to Jakob’s tale of the German Jews’ struggle resulting in Kristallnacht and the beginning of the holocaust, she has made this tale of fiction seeped in historic reality. Herr Brackman had once told Pietr that if people don’t want to know the truth, you can put it on the front page and they will find a way not to see it. But perhaps there is something different about hearing the truth. Or perhaps it has more to do with who is doing the telling. Do not miss A Master Plan for Rescue. Full of emotional highs and lows, it is the tale about a young boy who does whatever it takes to hang on to his belief in his father. I really enjoyed this one. Thanks to First to Read for providing me with a free copy of this book in exchange for an honest review. This sounds like an interesting book. I love WWII fiction, it’s really emotionally draining to read but it’s a period of history that I’m really interested in and I’ve found so many great books based around that period.